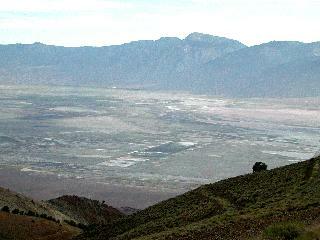 Cerro Gordo, on the western slope of the Inyo Mountains about seven miles east of Keeler and thirty miles south of Independence, was the first major silver strike in the Owens Valley. Originally a small-scale operation worked by Mexicans between 1862 and 1866, the mine was included in the Lone Pine Mining District organized in April 1866. Three years later Americans took over the property and ultimately turned it into the largest producer of silver and lead in California, yielding ores that assayed at least as high as $300 per ton. 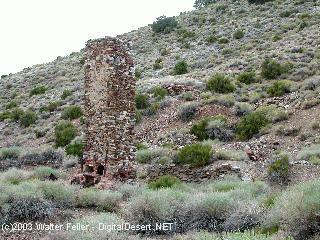 In the early 1870s two smelters were erected at Cerro Gordo and one on Owens Lake near the rival town of Swansea. Contributing to Cerro Gordo's commercial success was the fact that this was an excellent area for smelting works: water and wood were abundant, good fire-clay was available, and because of the wide variety of ores in the district, necessary fluxes were obtainable. 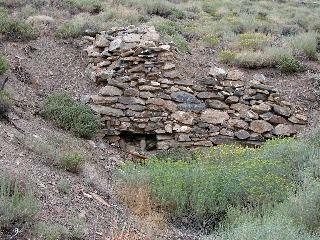 Productive mines of the area were the historic Union Mine, and the later Cerro Gordo, Cerro Gordo Extension, Estelle, Silver Reef, and Santa Rosa mines. Mule teams transported the ore to Los Angeles, 275 miles away, necessitating high-class ore and bullion in order to make a profit. In 1875 Cerro Gordo suffered a series of setbacks, necessitating the shutdown of its furnaces. These problems resulted from a scarcity of ore in the mine, which had lasted for several months, and the temporary drying up of its water supply; no small factor in the slowdown of production was the litigation that had been initiated in 1870 over ownership of the Union lode. This latter question was finally settled, and on 13 January 1876 the Union Consolidated Mining Company of Cerro Gordo was created and preparations made to return to full-scale production. The revival was not destined to last, however, and by late 1876 and early 1877 the Union Mine appeared to be played out. A fire that raged through some of the mine buildings and the Union shaft was the final straw; the furnaces were closed the following February. A more lethal blow was dealt by falling lead and silver prices, effectively ending this era of activity at Cerro Gordo.